When we were in Hawai’i a few months ago we had Green Tea Crème Brûlée at Chibo Okonomiyaki House for dessert. I fell in love with it and planned on making it at home. This was my husband’s Valentine’s Day dessert this year. The green tea flavors goes well with the custard and the end result is a light green tea flavor with a creamy, smooth texture. Matcha Green Tea powder can often be found in the bulk foods and spices section of the grocery store. This way you can buy small amounts for use in your recipe. I found mine at Whole Foods in Austin, TX. 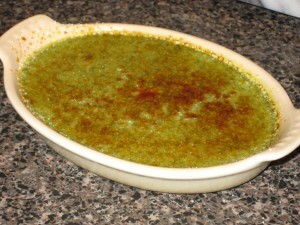 Adjust the amount of green tea powder you put in the Green Tea Crème Brûlée recipe to give it the flavor you want.